How had I never even heard of this book until this read-a-thon? Tiger Eyes is amazing. It's a portrait of a family in grief, making a break for a new city in the wake of a father's death. On the night that my father was killed, after the police and the neighbors had left, Jason and I got into bed with Mom. We'd left a light on in every room. The house was very quiet and I thought about how strange it is that sometimes quiet can be comforting, while other times, it becomes frightening. "What's it like to be dead?" Jason asked Mom. "How do you know?" Jason said. "I don't really," Mom said." It would be very easy to criticize this book for being overdramatic, for going for the easy emotions, if it weren't so well-written. More than one person dies in this book, and one of the deaths is sort of a tear-jerker. As a kid I read a few books about girls dying nobly of cancer, and I hated them. They seemed too manipulative, even for a sap like me. How is it that Judy Blume nails ordinary experience every time? At the funeral, Davey is distracted by sweat pooling in her bra. In her new town, she's extremely anxious about fitting in, despite the fact that her father has just been killed. As humans tend to be, she is preoccupied by ordinary human things. She does not cry much. I particularly like this book because of the symbolic weight it allows itself to carry. (Not a normal Blume trait.) There's the canyon that Davey stupidly hikes into without preparation. There's the atom bomb industry that dictates the lives of everyone in town. There's the non-urban, non-East-Coast setting-- refreshing after so many books that take place in New Jersey. Everything speaks to the alienation, the otherworldliness of grief. The total devastation. Davey may as well be on the moon. 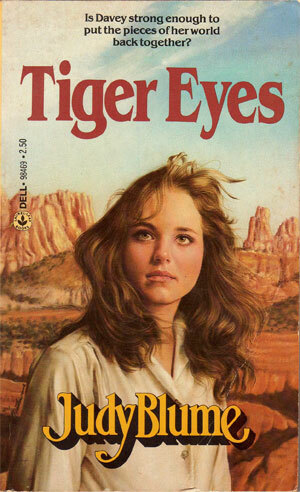 Judy's son Larry (the inspiration for Fudge, and now a grown man and film director) will be making Tiger Eyes into a movie this year. I hope very much that it is awesome. I think it could be. I can't wait to see it.